Lesson Plan Booster: How Can We Improve Homework? This guide can be used to help generate ideas for homework that students will not dread. Students realize that homework can be a fun extension of class. Another benefit is that the class takes a leadership role and participates in the democratic process. Students create a home page or small Web site based on a theme related to a recent history or social studies lessons. Students develop an understanding of third-world and first-world problems and discuss issues related to the role of computer games in education. Help your high school students perform their best on upcoming college admissions or state standardized tests with this fun and informative lesson plan. Students research test-taking tips focusing on nutrition, sleep, stress reducers, and more, and then present their findings -- in a variety of fun projects -- to another class or grade level. In this interdisciplinary lesson, students in grades 3-8 research basic principles for flag design, find out how their city's flag (or the flag of a nearby city) ranked in a national survey, and then use the computer to create their own community flags. Do you have middle or high school students who are eager to debate current events, but sometimes lack evidence for their arguments? Or, are students struggling to understand the challenges faced in a developing country? If so, this lesson plan, using online resources and a spreadsheet program, may be just what you need to inform and inspire classroom discussions! Students love to spend time on the computer, especially in early childhood. Why not use that time to practice classroom skills? In this lesson, students use the computer mouse to order sets of clip art in a Word document. Seventeen teachers at Alexandria Middle Magnet School for Math and Science in Alexandria, Louisiana, have shared their favorite lessons. You're sure to find a lesson or two here to add to your bag of tricks! Make This Week's Lessons Pop(corn)! These lesson plans will engage students as they create popcorn timelines, maps, and graphs; do popcorn science and math; explore popcorn history and nutrition; and -- don't forget the best part-- eat popcorn snacks. Reviewing for those inevitable end-of-unit tests doesn't have to be tedious for you and boring for your students. Liven up your review lessons -- or reinforce previously taught skills --with one of the games below! A fun -- and educational -- time will be had by all! Icebreaker activities offer fun ways to get to know your new students -- and for them to get to know one another. Get the year off to a good start with one of the twelve new icebreakers below. Included: Links to our library of more than 100 icebreakers! Why not go out on a limb! Springtime and Arbor Day are great times to branch out and include in your curriculum timely lessons about trees. Included: Lessons for measuring trees, reading a color key map, creating tree silhouettes and a "good behavior tree," more. The Iditarod is a "teachable moment" that rivals few others. Wise teachers use this annual sled dog race to teach geography and language skills, history, and science. This week, Education World provides 10 math work sheets for students in grades 4 to 8. Alaska in March is the place to be -- if you want to breathe life into tired lessons, or if you simply need to engage students who have a little cabin (or classroom) fever. Included: Ideas for working in language arts, geography, math, history, spelling, more! Stuck for fun or new ways to teach about the 50 states (or Canadian provinces and Australian states)? Education World offers five lessons to liven up your 50 States unit. No names on papers? No titles on compositions? No answers rounded to the nearest tenth? If you find yourself confronting such problems while grading papers, your students may not be paying attention to directions. 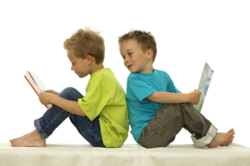 Although most successful students recognize the importance of reading instructions thoroughly and following them, some students may master the skill slowly. Education World provides five intriguing lessons to help your students read, write, follow, and even evaluate directions. Each month, Education World provides a monthly calendar that teachers can use to help students practice essential skills. Regular practice will keep students' skills from getting rusty -- and should improve test scores too! April is School Library Media Month, a great time to reexamine your students' library know-how! Do your students know diddly about Dewey? Do they believe that "biography" is a television show? Do they think call numbers belong in a telephone's memory? Are your students convinced that a "librarian" is a person born under the sign of Libra? If so, it's time to reel them in and get them reacquainted with reading, researching, and the library! Start with a clean slate next semester -- introduce mini-whiteboards to your classroom! Students love working on their own whiteboards; it's a great way of keeping an entire class actively involved in a lesson. This week, Education World offers five lessons to engage students in learning with whiteboards. Can you trust everything you read on the Internet? Can you trust anything you read on the Internet? Teach your kids which Web sites to trust! Do you need ideas for occupying students during the last ten minutes of a busy day? Perhaps you want to reward kids at the end of a particularly productive day. These ten games are great for end-of-the-day fun. You can link many of them to classroom curricula too! What do you do with those awkward moments that arise in every teacher's day, those times between classes or before specials, when there's no time for a new lesson but plenty of time for kids to act up? Try some mini lessons, quick activities that fill time without wasting it! Included: Dozens of mini lessons to keep kids busy -- and learning -- every minute of the day! Whether you are a substitute teacher whose lessons fall short of filling up the day or a permanent classroom teacher whose days involve lots of little transitional moments, these lessons will work for you! Everyday reinforcement of basic reading, listening, math, vocabulary, and geography skills can go a long way toward ensuring that kids learn and retain the skills you teach. You're sure to see the results of daily reinforcement in end-of-year test results too! Here they are -- 12 quick tips to help make managing your classroom a breeze! Included are tips for getting to know your students, communicating with parents, getting your day of to a good start, and much more! If you can't beat 'em, join 'em! Make the most of your students' interest in the NCAA basketball tournaments with these cross-curricular lessons and activities. So much to do! So little time! You can't afford to waste a minute. What do you do when every day is interrupted by at least a few transitions that never seem to fit into the natural rhythm of your lessons. Fill those minutes with real learning by introducing your students to one of these valuable mini lessons. The Infoplease Kids' Almanac is a great Internet fact resource for kids of all ages. This week, Education World has created three scavenger hunts using this terrific on-line resource. Each hunt challenges students to find interesting facts about the world they live in --- while they practice and improve their study skills! Included: A different "hunt" for kids in grades 1-3, 4-5, and 6-up. School Stats: Real Numbers = Math and Geography Fun! Combine back-to-school talk with the Internet to create a perfect learning activity! Students surf a special site created with them in mind and compare their school numbers with those of schools in other parts of the United States. Work in math, geography, graphing, and much more! Included: Teaching masters for use across the grades. Alaska's annual Iditarod Dogsled Race is a perfectly "teachable moment." Wise teachers are using the race and the many Web sites connected with it to teach geography, math, reading, and language arts. More than that, this annual race can teach students a thing or two about fairness in competition and about the pride and dignity that comes with seeing a job through to its completion. Included: Iditarod activities for use across the grades! From Maize to Milk: A Barnyard Full of Activities! Put on your straw hat and grab a pitchfork -- it's time to go down on the farm! These activities -- centered around pigs, corn, milk, and more -- are guaranteed to make your students "hoot and holler"! Activities for all ages! Planes and Trains and Automobiles and Study Skills! Celebrate National Transportation Month -- "transport" students to a dozen activities that provide practice in reading maps, schedules, timetables, and more. Included: Four study skills teaching master activities for students! The anniversary of the Sears Tower "topping out" is the perfect time to explore some of the world's tallest buildings! Skyscrapers are a great curriculum topic -- with lots of concepts and numbers for students to wrap their minds around! Included: Activities across the curriculum! Why All the EGGS-citement About EGGS? Eggs-ploit the egg with an eggs-plosion of across-the curriculum egg-tivities for all grades! Spiderwebs and Halloween go together. But, this Halloween, let's turn the "discussion" to webs of another kind -- Discussion Webs! Included -- Tons of ideas for active discussions across the curriculum and across the grades! The story behind the creation of the U.S. Postal Service's new dino stamps is an ideal tool for building listening and sequencing skills.